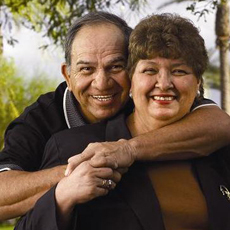 Bob and Joann Olivas founded Angelita's Amigos in 1988 to honor their daughter Angela Grace, who died of leukemia when she was four. When Angela was a patient at St. Joseph’s Children’s Health Center her parents were at her side 24 hours a day during several lengthy stays. It was their time spent in the small hospital rooms that lead them to thinking about creating a new space for families that would make them feel more comfortable and take away some of the stress they were experiencing. "Every night that we stayed here, the room got smaller and smaller. After a while, you find it hard to breathe," says Bob Olivas. This non-profit foundation began funding "family-friendly" rooms for hospitalized children and their families. The rooms include features such as sofas that convert to beds, a television and DVD player, wood floors, a refrigerator and other decorative items to create a home-like atmosphere.